Our summer vacation took us through five states within a week’s time. 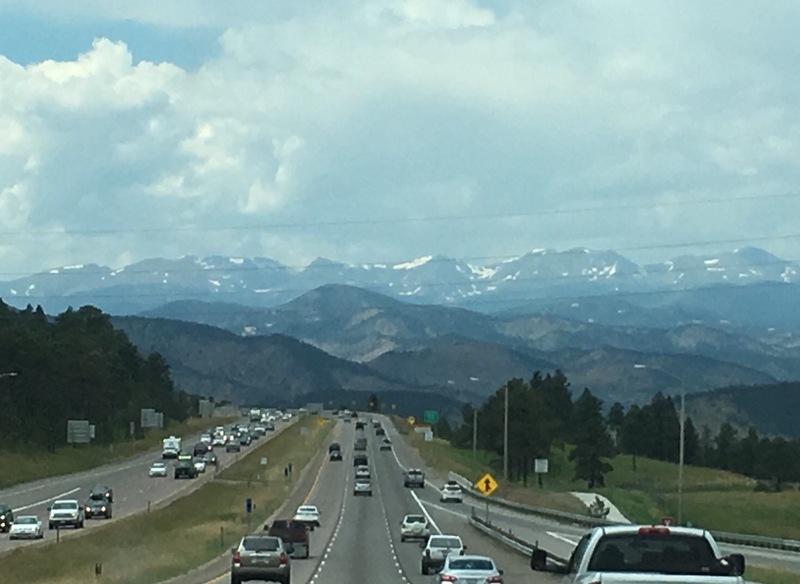 Our main destination was Colorado, because we had never been there before, but our route took us through other new areas, as well. We did an awful lot of driving and within that short time span the vistas changed dramatically, as did the temperatures. (They ranged from mid-40s, to 112!!) 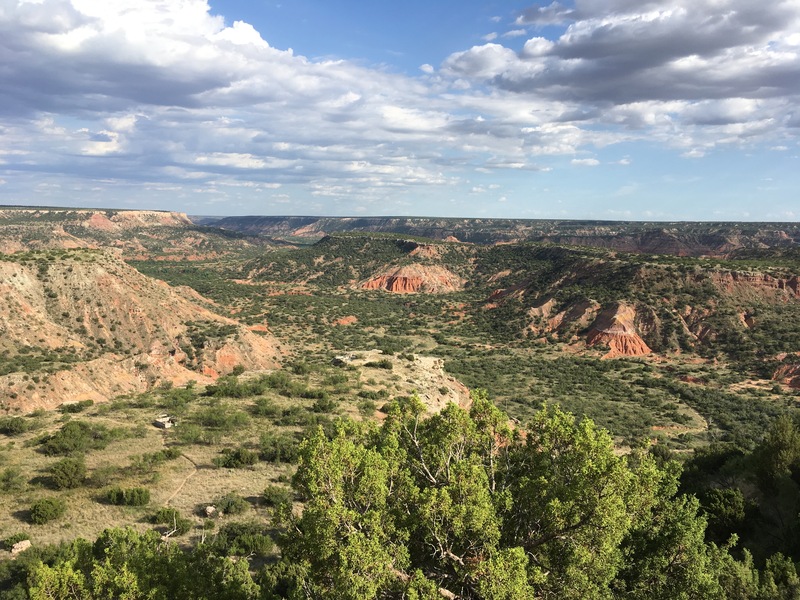 We started in the Ozark “mountains,” went through the flat high plains, then through the Rocky Mountains, and then through arid New Mexico and the Panhandle of Texas. Then drove the entire width of Oklahoma on our return home. I was happy to see some areas of our beautiful country that I had never seen before. 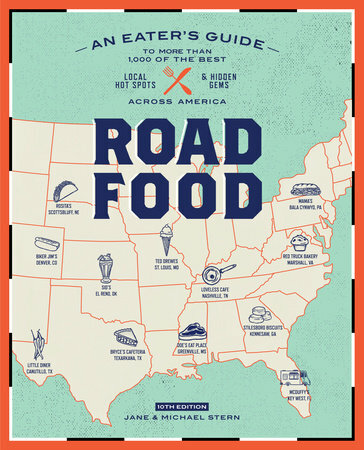 Roadfood ~ The Roadtripper’s Companion is a companion post to this one. We ate really well on this trip, thanks to this handy book! My dad grew up in Kansas, so the corn and wheat fields, and grain elevators brought back childhood memories of my grandparents’ farm and grain elevator. It was interesting to see all of the wind turbines looming on the horizon. I was surprised there were so many of them. We saw them again as we drove through the Texas Panhandle and Western Oklahoma. 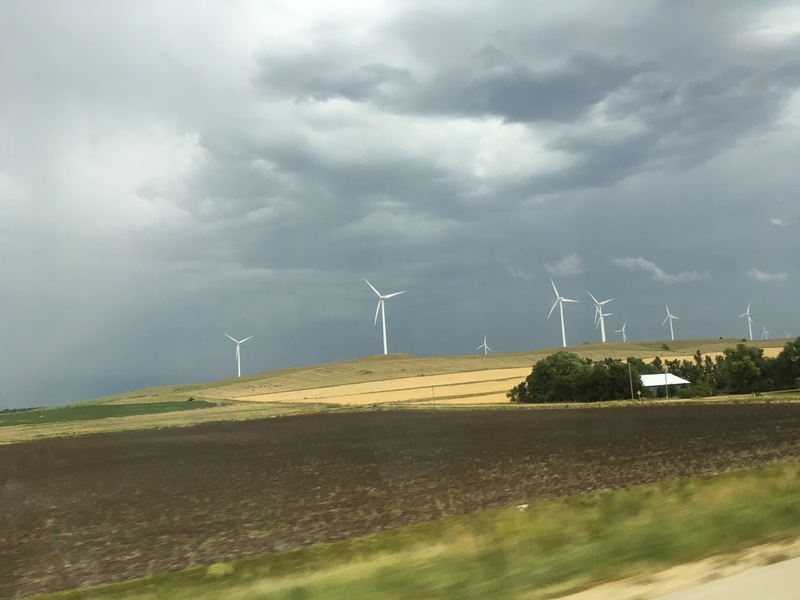 When we were driving west in the high plains of western Kansas, we headed into a storm. The contrast between the dark sky and the golden wheat fields was beautiful. That was the first time that the first verse of “America the Beautiful” popped into my head, and it lodged there for the duration of the trip. As we crossed the state line into Colorado, I remembered a time when I was very young and traveling with my parents. As we crossed a state line my dad raised his hands in the air and exclaimed, “Yay, we’re in Arkansas!” For some reason it amazed me that he could take both of his hands off of the steering wheel and I remember it vividly to this day. I was in total awe of the mountains. 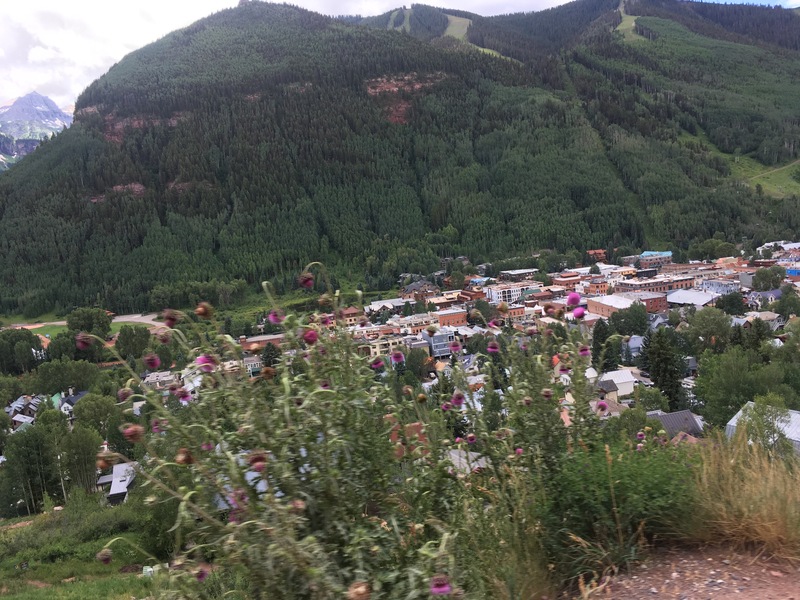 We visited Breckenridge, Ouray, Telluride, and Durango. At first Margaret and I took lots of photos, but we realized it was impossible to capture their grandeur and slowed down. At times, we’d be exclaiming, “Wow, look at that!” while pointing out opposite sides of the car. The majestic mountains coming into view took my breath away! 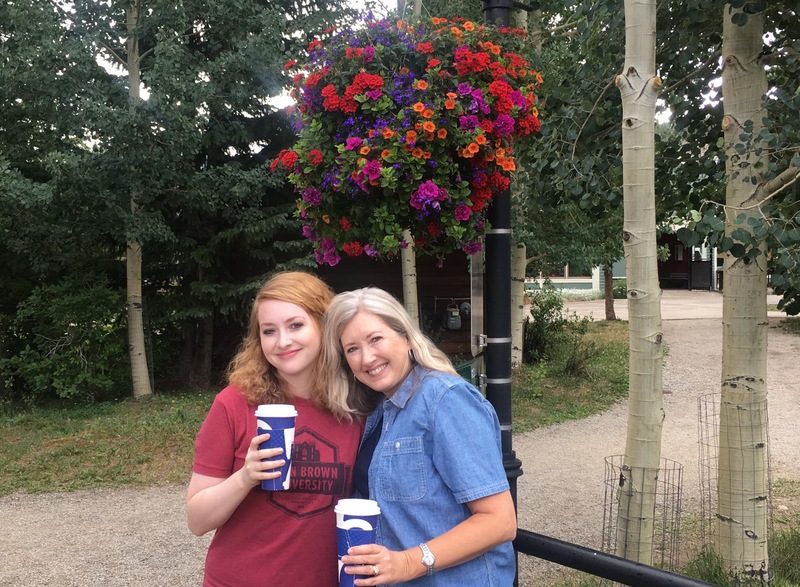 Our first stop was in Breckinridge where we spent a few days. The gardener in me was envious of the flowers literally everywhere! The native trees and plants were all so beautiful. I didn’t even see a weed I didn’t like. My nickname for Margaret is Petunia, so it was appropriate to get a picture beneath a basket of them. It’s a beautiful town, and the weather was nice. We had a little rain, but you know I like rain, so no problem. 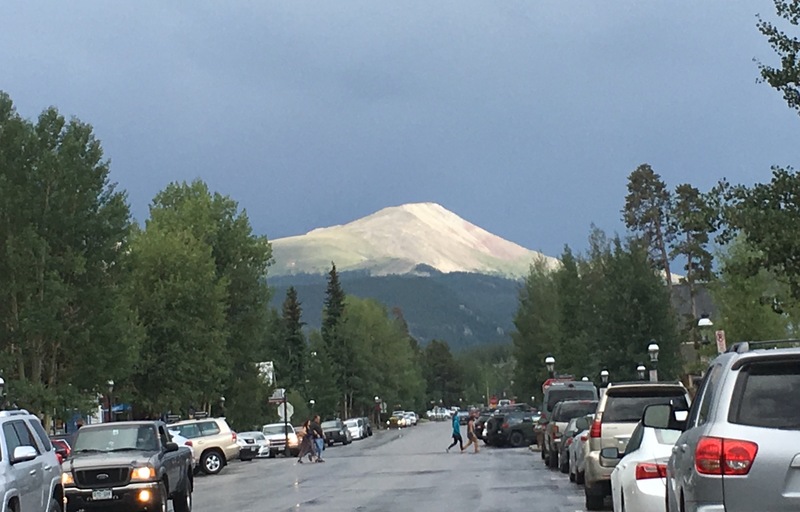 A drizzly evening in Breckinridge. We rode the Alpine Coaster and that was a lot of fun! We also went on a guided Jeep tour. Everywhere that we ate was really good. We also got some good exercise, walking everywhere. 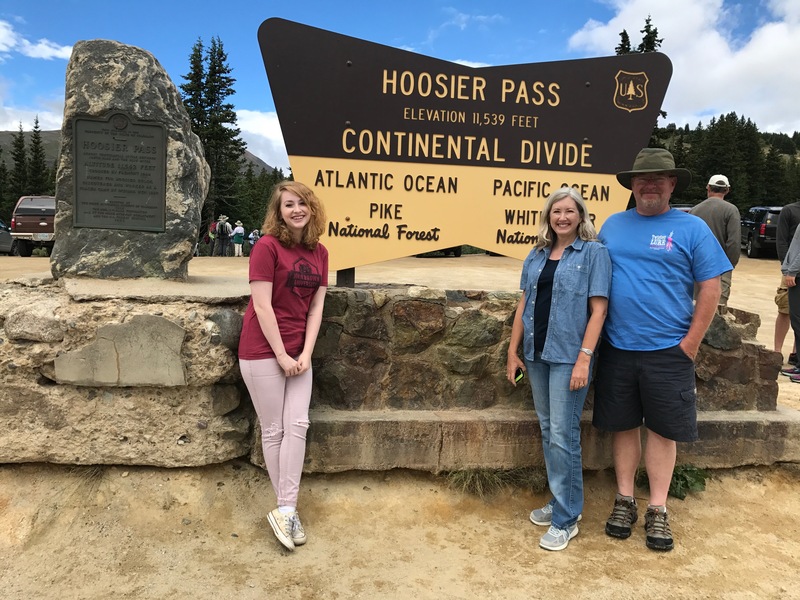 While near Breckinridge, Colorado, we stopped at the Continental Divide marker. It was a popular photo op, so other tourists were also waiting their turn to take their picture with it. We offered to take another group’s photo and learned that they were also from Missouri and lived about an hour from us. It was rainy and chilly, so we hurriedly took our pictures and jumped back in the car. The next day we were driving back by it, so we decided to stop and take another picture with the improved weather. Again, we traded taking pictures with another group, and they, too, were from Missouri! 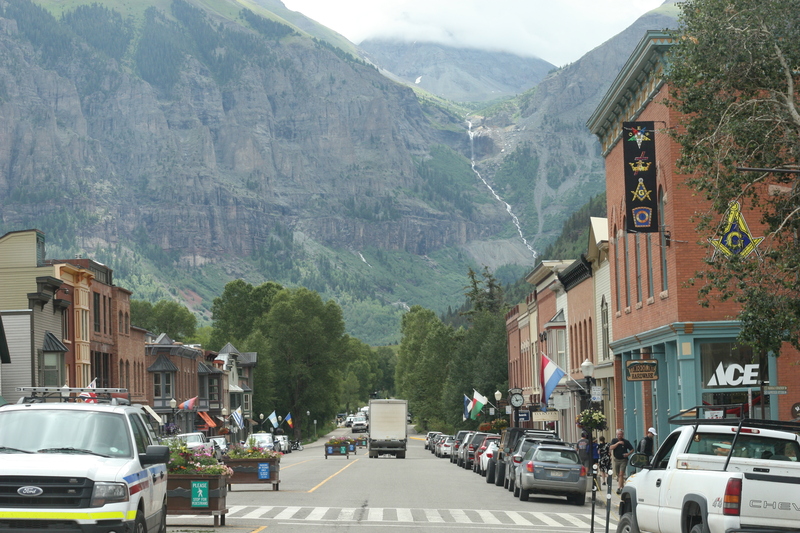 Ouray was a beautiful little town, nestled picturesquely in the mountains. We all agreed that we’d like to return and spend more time. 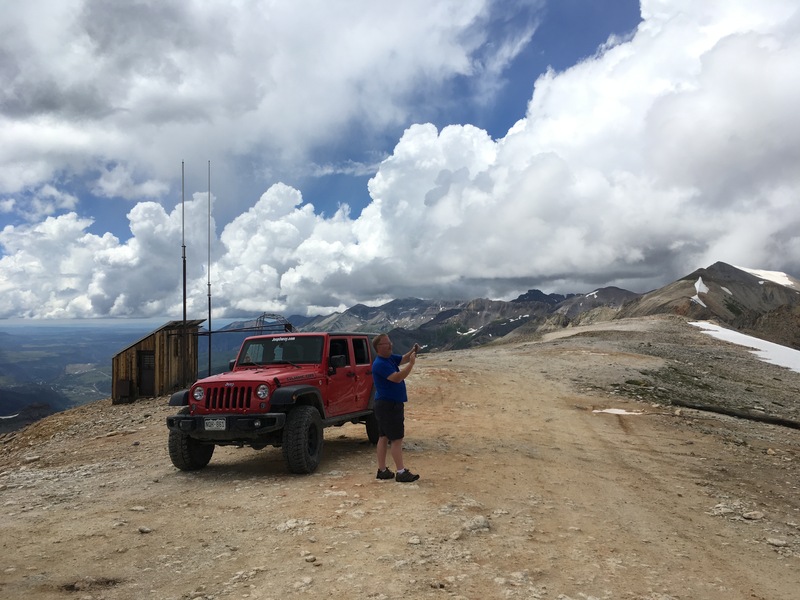 While there, we rented a Jeep and spent the day driving over a couple of mountain passes. We weren’t sure what to expect, and I think that was a good thing, because we might not have gone. The narrow trails took us along the edge of the mountains. It was usually only wide enough for one vehicle, so if we met someone going the opposite way, both drivers had to navigate carefully. 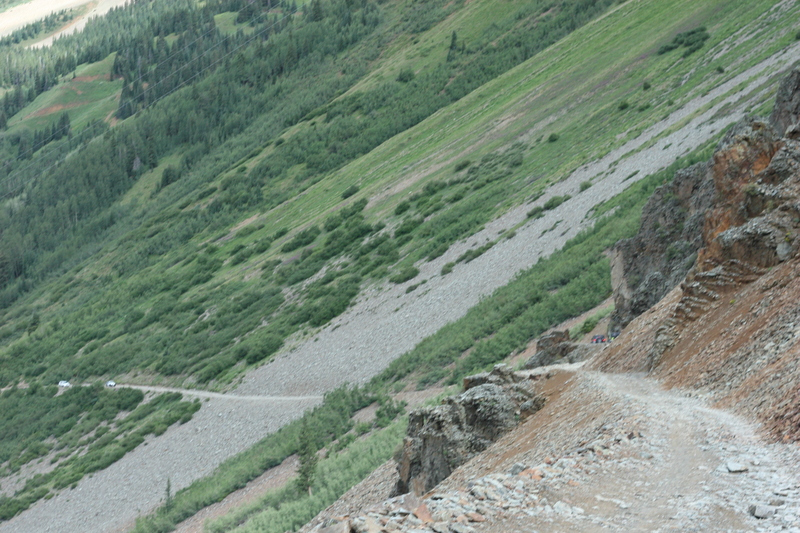 A few times, I was afraid that the vehicle passing us was going to flip over on top of us as it squeaked by on the mountain incline. Narrow treacherous road. I hope nobody comes around that corner! 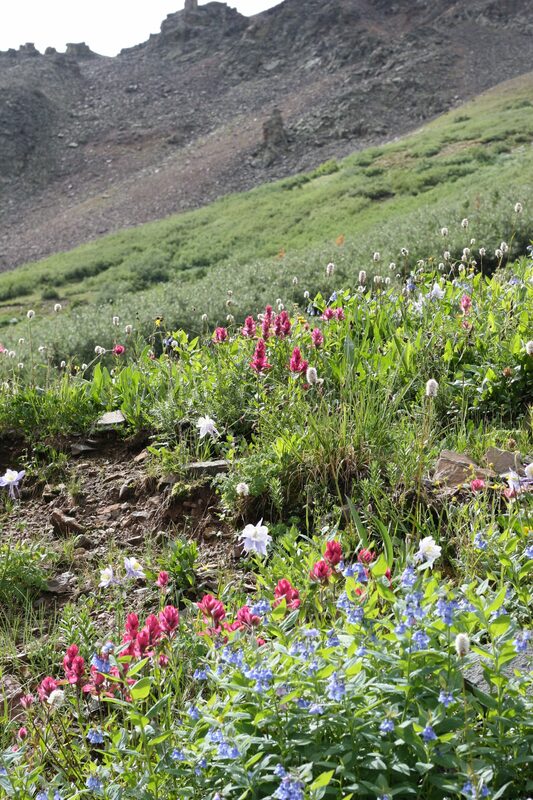 I was amazed at all of the wildflowers and would have liked to have taken more pictures of them. They thickly covered the hillsides. The narrow mountain road. Note the approaching vehicles. 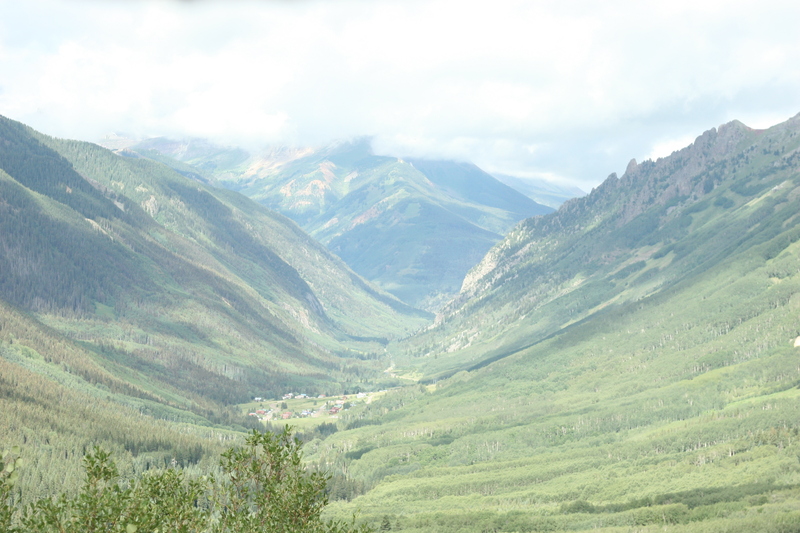 As we descended from Ophir Pass we had this beautiful view of Ophir, a little mountain village. 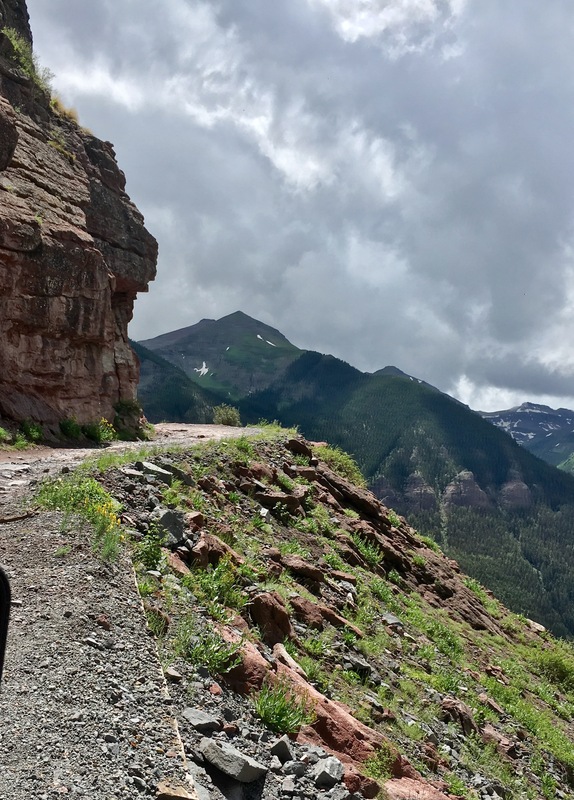 Mid-way through our Jeep excursion, we briefly visited Telluride for lunch. 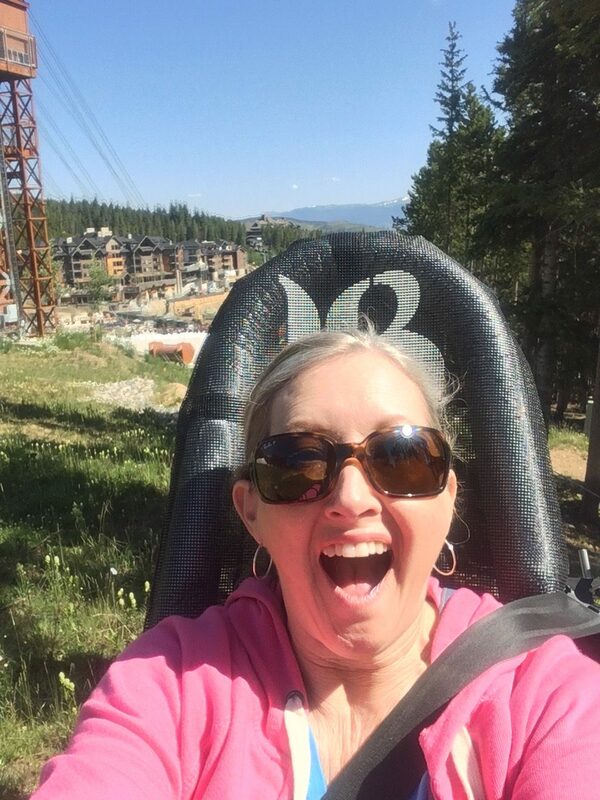 Both there and in Breckinridge we rode the gondolas to enjoy the beautiful views. I couldn’t believe they were free! That was a fun new experience for me. 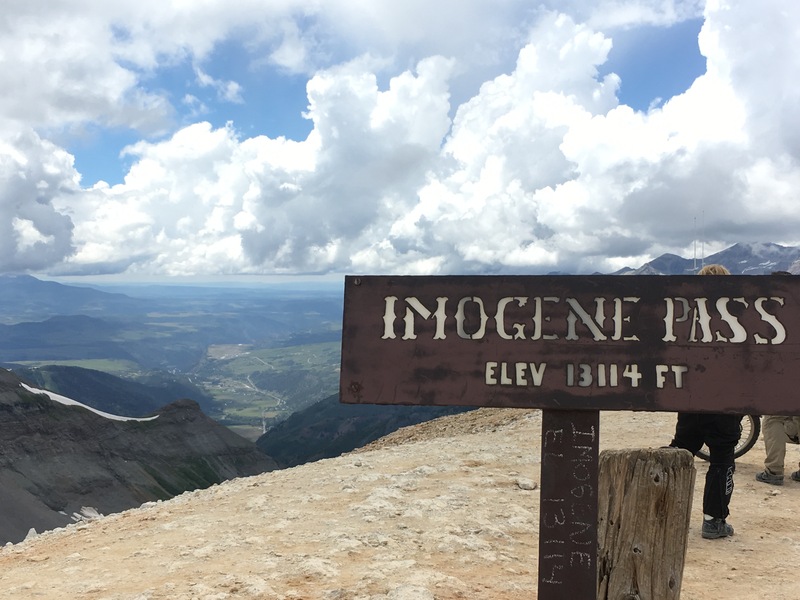 So far, so good, but our next destination, the Imogene Pass, was at 14,000 ft, so off we went. Margaret and I “oohed” and “ahed” while taking pictures, but Scott had to keep his eyes on the narrow trail. It wasn’t for the faint of heart, for sure. Um, yah, that looks safe! 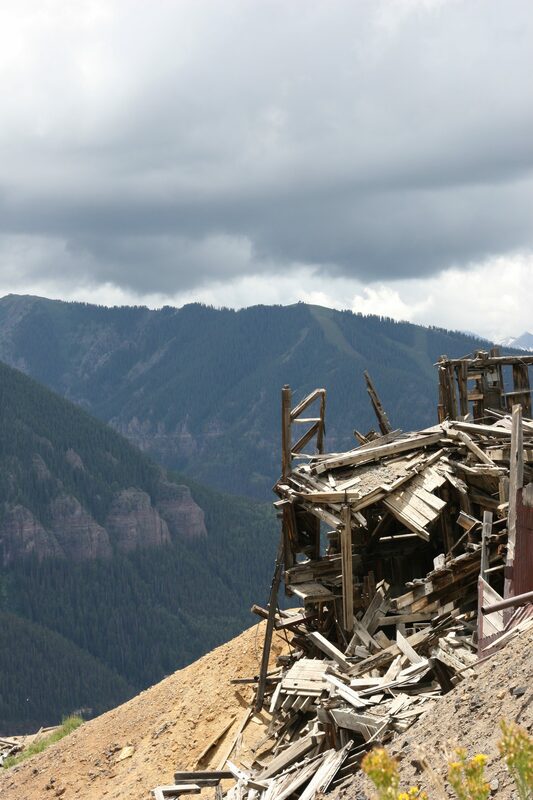 During our driving adventure, we often saw remains of old mining operations. Be sure to check your accommodations on TripAdvisor. 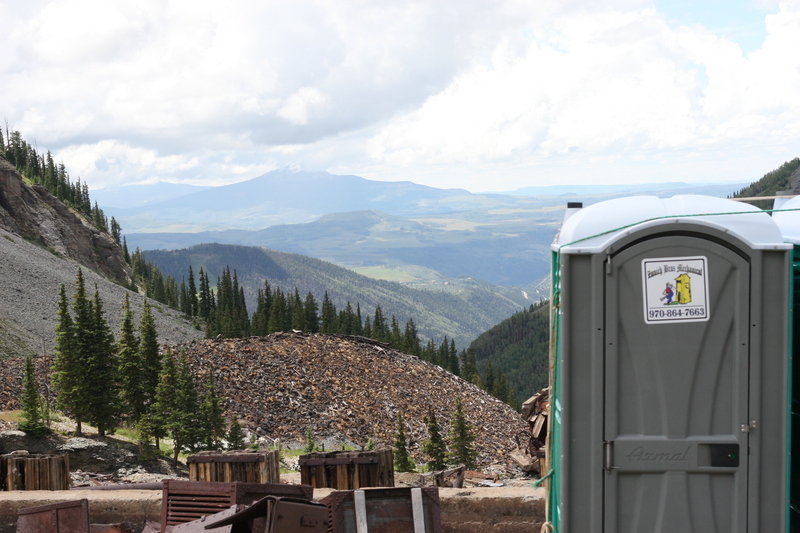 A Port-a-Potty with a view. If you make it up to 8,000 ft, you’re rewarded with a rest stop. 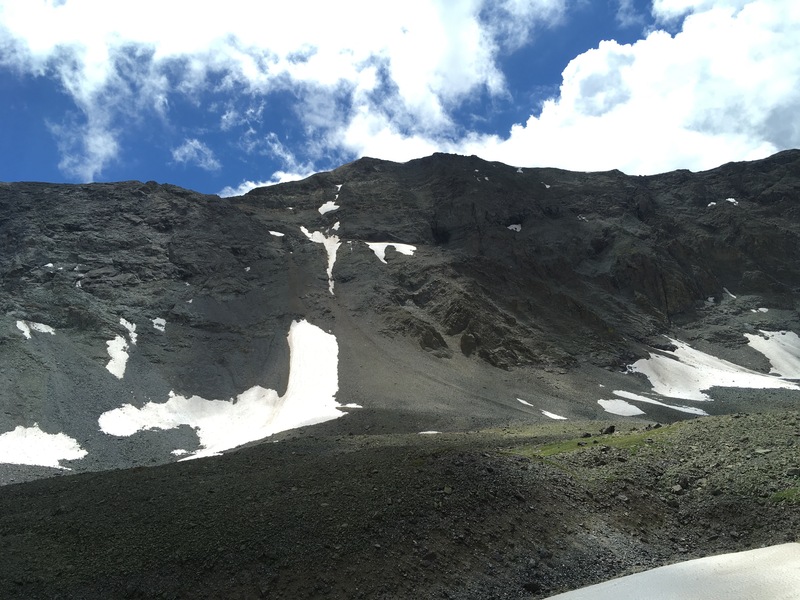 With sparse vegetation and greenish rocks, the top of the mountains reminded me of the moon. I thought that was the closest I’d get to being an astronaut. I felt like an astronaut on the moon. 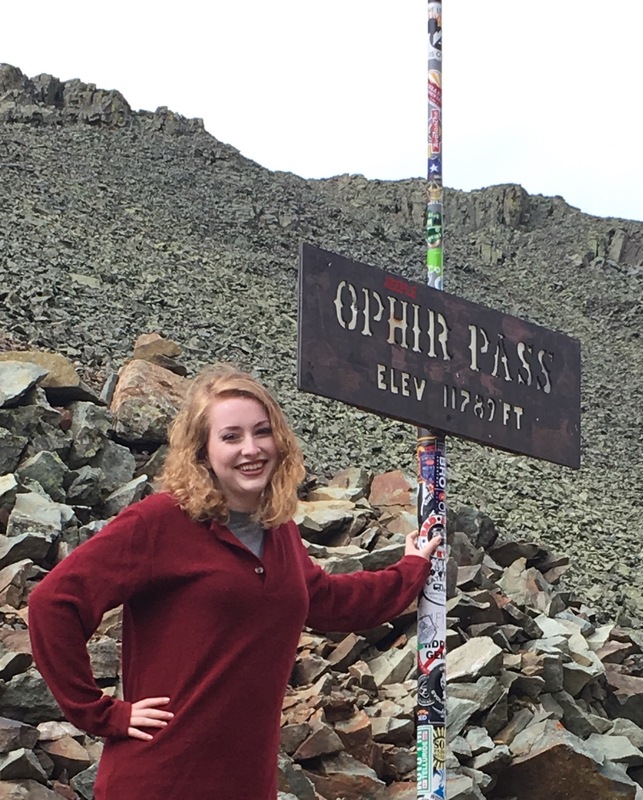 I can’t believe we were at the very top of a mountain at 14,000 ft! I’m glad we did it, but I think once was enough for me, especially on the Imogene. 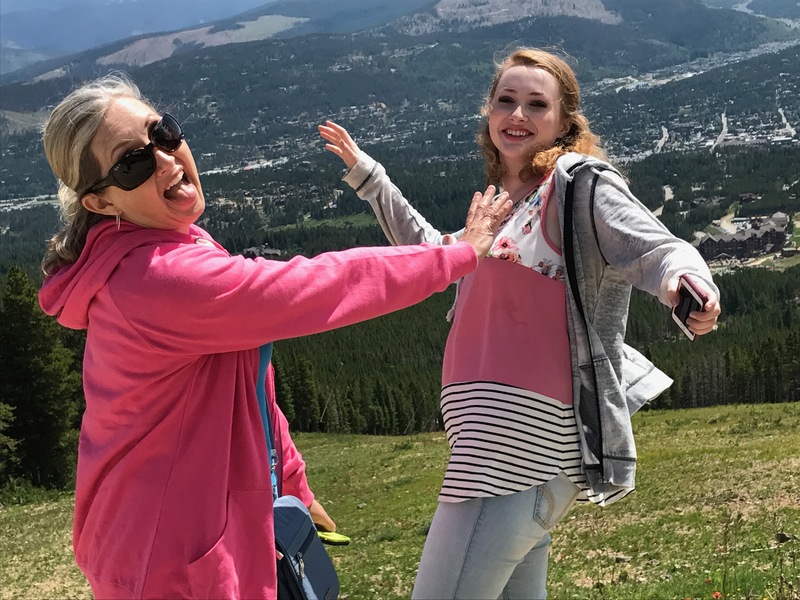 There was a lot more to our vacation, and it was literally all down hill from there. It was all great, except for the fact that our son wasn’t with us. 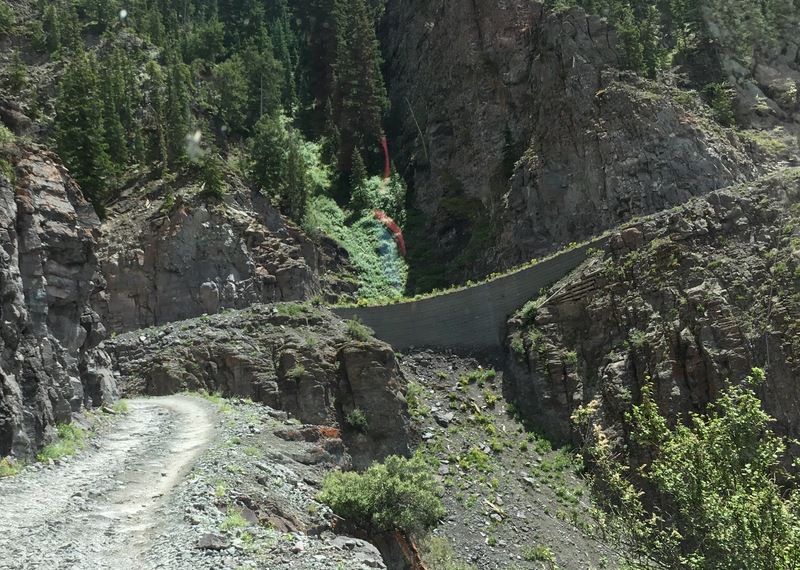 We spent a night in Durango, and then went to New Mexico. We spent an afternoon and evening in Santa Fe where we had just enough time to visit the vendors and buy a few souvenirs before it started pouring rain. The next morning we continued on to Amarillo where we ate at The Big Texan and then went to see the outdoor play, Texas, in the Palo Duro canyon. Although it was a very hot night, the play was good. 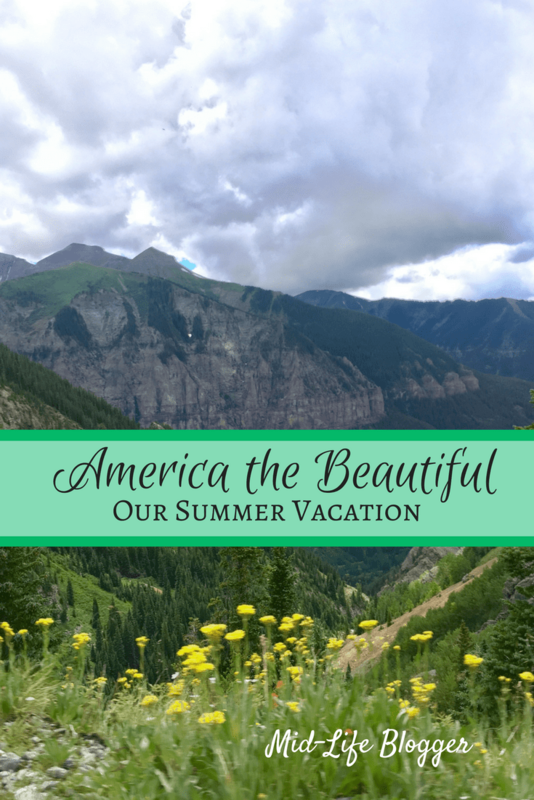 What I wanted to mention, though, was that the performance ended with the song…”America the Beautiful.” It was the theme of our vacation. Did you take a trip this summer? Where did you go? Please subscribe to see where the road takes us next. Sounds like a great trip. Beautiful pictures! Thank you! I would say it was exhilarating! Hi Michelle, I just saw your comment! Sorry it took me so long to get back to you. We are currently living in Corpus Christi, so close to Rockport. Time does have a way of slipping by so fast. That’s one of the reasons we hope to do some more traveling soon. Our kids seem to be growing so fast… I guess they all do. 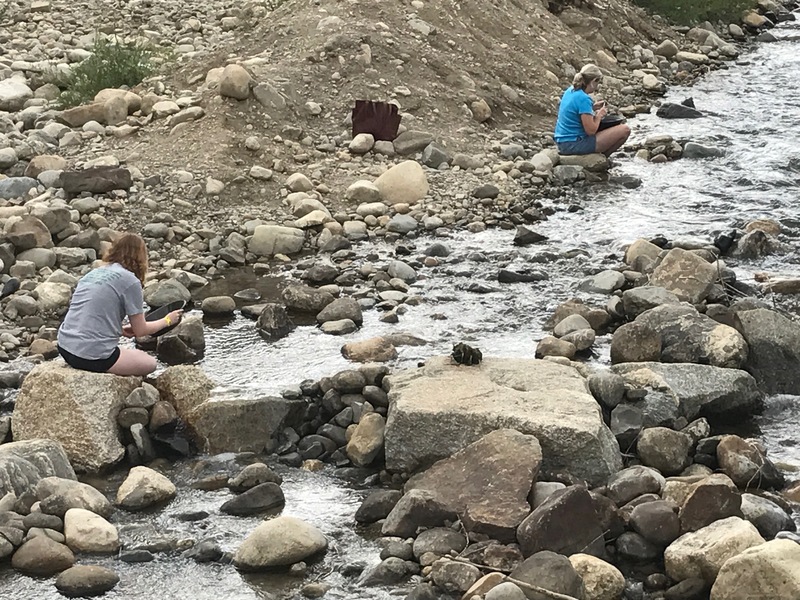 I think you’re right about Colorado and the geology study. We love national parks and there are some great ones in CO. We did the Grand Canyon this past year and it was a great spot for talking about geology. I’m watching the coverage of Hurricane Harvey right now. Did you survive alright? What a storm! Yes, we are safe, left Corpus Thursday afternoon and are staying in a hotel until at least Monday, not sure about power and water situation and how much more rain/flooding we’ll get. We’ve been watching all the coverage from here too and it’s really unbelievable, the Rockport and Port A area are in bad shape from the looks of the news reports. Yes, It’s terrible! I hope your home is alright. Thank you Michelle, we do too, but I trust God to take care of us no matter what. My family is safe so I am blessed. Gorgeous! I want to see the mountains some day, but I admit, I’m nervous about those roads! Looks like it was lots of fun! The major roads aren’t bad at all. You’ll have to go someday! Beautiful photos! Looks like you had a wonderful trip, and made lots of memories! Thank you! I think we did. We had a lot of new experiences. What a fun trip and such beautiful photos!